Steller is the easiest way to discover, create, and share incredible stories with photos, videos, and text. Create beautiful visual stories with photos, videos and text right on your iPhone. Personalize the look and feel of your story with elegant + simple-to-use design themes. 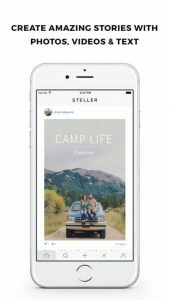 Publish your stories on Steller publicly or privately. Share your stories on your other social networks. Share your stories as Instant Articles on Facebook. Send your stories via email and sms. Embed your stories on your blog and website. Share your profile on your favorite social networks. Like and comment on stories in the Steller community. Republish stories into collections to save and share. Discover new stories every day on wide range of topics including travel, action + outdoors, photography, animation, food and more. Follow your favorite users and topics. Participate in fun + creative weekly community hashtag projects. Send us a note to @stellerstories on Twitter or email us directly at support@mombo.com.